Got this BTI Bluetooh Device from dx.com (link at the bottom) at a very good price of Rs. 2750. We bought a total of 3 devices so got a little discount as well. As usual for any item ordered from China (Read the review here), it takes around 30-40 days to reach you. I would try to give a description and review of all aspects of this product in this post. The box comes with a sturdy cardboard packing and inside it there is a very light weight Bluetooth device with antenna, a helmet mount, small star screws (2 to be used and 2 extra), a Velcro-sticker type speaker set linked with a microphone with a flexible arm and a USB/AC charger. So to use this device first of all you have to install the speaker-mic set inside your helmet. This SMS (Speaker Mic Set) can fit inside any helmet easily. You got two stickers which are supposed to be fitted on the helmet shell inside the left and right padding of the helmet and the speaker is supposed to be Velcro fitted on it, then the padding goes over it to cover the speakers. 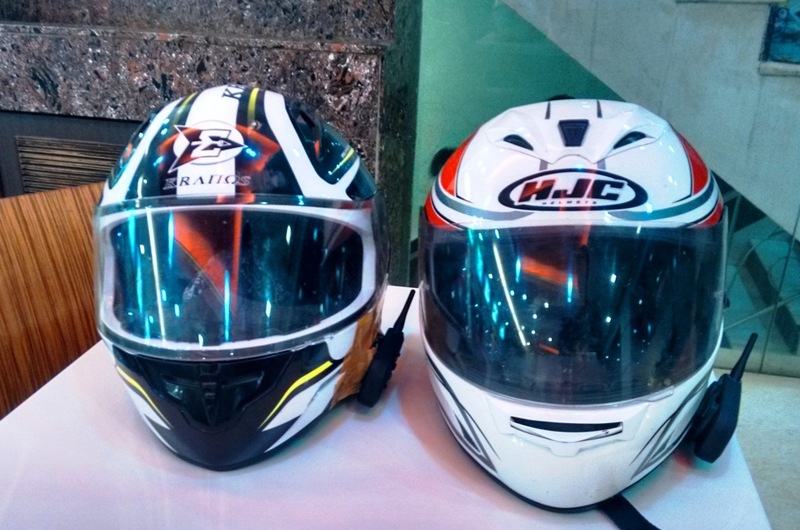 While the left and right speakers are linked with a wire which goes under the center padding of the helmet. And the microphone arm which comes underneath the front padding and the mic rests right in front of your mouth along the helmet. For mounting the Bluetooth device, you need to fit the teeth like opening over the edge of the helmet shell and tighten the screws. Now this can give you some task and work to do because initially you might think that the mount is not clinched properly and it will fall of helmet edge even if the screws are tightened. But you need to push the mount really inside till the helmet edge comes between the mount teeth and then tighten the screws. With practice and repeated usage, you will get the hang of it and then it becomes easy to use. Once this is done you have to insert the speaker jack in the Bluetooth device to start using it. But here is a tip, fixing the speakers inside the padding offers very low audibility on road when you are riding as there is a lot of wind noise already. To overcome this, you can just let the speaker rest on top of the left and right padding, the Velcro behind easily manages to stick on the top of the helmet padding too. This small tweak increases the audibility many folds and now the audio is so much clear and loud that you actually have to reduce the volume. My co-rider was speaking in normal volume but I felt he was screaming. Works great. At very high speeds (Over 140 and above), there is wind noise and it might reduce the audibility. Now there is a user manual which comes along with it which explains how to switch this thing ON-OFF, connecting with other such device, specifications etc. so I am not going to give all the details here. But what is important to mention here is that connection to another (co-rider’s) device is just a button press away. Once the devices are connected you here a ‘tuduk’ sound and you are good to go. In absence of the other device, you can connect this to your mobile phone via Bluetooth and enjoy listening to songs, and answer calls. The calls are attended automatically when this device is connected to your mobile phone. After lot of searching online on many websites I was able to find this device which had a range of 1.2km! This range was tested on road on my Ride to Mathura and it does work for 1.1-1.2 km range flawlessly after which the connection starts to break. While riding within the town which has a lot of buildings and trees, the connection might fluctuate but only for a fraction of second when the two riders are not on the same straight road. A group of 6 riders, each having this device can be connected with each other! The build quality of the device is good enough to feel good in your hands and it has a nice matte finish. The power off button is small so it might a little working to turn it off while you are wearing gloves, until you take off the helmet and try to do it. The device is water resistant and can survive a light rainfall. One full charge to this device can last a connection and usage time of around 9-10 hours. That’s awesome in my opinion. The biggest benefit of this device, i.e. being able to communicate to your co-rider (be it pillion or another rider on road) is that your ride quality increases a lot. This happens when you decide talking inside your helmet where will you stop, or you are stopping to pee or drink water. Suppose you face a problem in your bike you can immediately inform the rider ahead of you and he will come to know of it, instead of riding away until he has to sense himself that you are not following him for long and thus come back looking for you. Many a times you want to inform the other rider behind you of a pothole, a speed breaker, or a turn which you have to take, this device makes it so much easier and to communicate all such things. Decision making becomes very quick. If you liked this review, share this post with your co-rider friends with whom you’d like to stay connected on your rides! And do comment below if you have any query. Thanks a lot for reading. Ride Safe! On the off chance that you watch out for what is going on in the realm of motorbikes, then you might well have seen the development of another type of helmet for bikers. We investigate bluetooth motorcycle helmet. Yes you can listen to music, talk to your passenger and use your phone or GPS on your motorcycle all while using a half helmet! Here are options that work well and some highlights of what factors should influence your choice. can all the three connect n talk at the same time? They automatically switch back to the music when you finish attending to your call. It becomes easy to move around. You can enjoy doing workout by using the best headsets. One headset manufacturer in particular is Samsung. Samsung has demonstrated its versatility in the mobile industry by targeting the rapidly-growing mobile accessory market with the launch of some new Bluetooth headsets.